US, 1985, 90 minutes, Colour. Kevin Costner, Kiefer Sutherland, Christopher Lloyd. Directed by Steven Spielberg, William Dear, Robert Zemeckis. Amazing Stories is a collection from the television series produced by Steven Spielberg for his production company Amblin Entertainment. They bear the markings of Spielberg's imagination. He directed the first section, The Mission. William Dear (Harry and the Hendersons) and Robert Zemeckis (Romancing the Stone, Back to the Future) directs the third story, Go To The Head Of The Class. The films are obviously television anthologies - but offer the opportunity to see them on the big screen and to have a look, especially at Spielberg's work. (Other contributors to the series included Martin Scorsese, Clint Eastwood and Paul Bartel). The first film is enjoyable and(has an atmosphere of terror as Gunner is trapped in the bomber floor turret and the plane has to land. The interest in planes reminds us of Spielberg's Empire of the Sun. Kevin Costner has a good role and the film also includes Kiefer Sutherland. Mummy is brief but funny - a man acting the part of a mummy has to rush to the hospital to see his wife who is having a baby. However, he is unable to get out of his mummy clothes. In the meantime, a real mummy is loose in the swamps. Go To The Head Of The Class gives Christopher Lloyd (Back to the Future) an opportunity to give another madly eccentric performance as a tyrannical teacher whose head is removed - and he has to give his classes with his head under his arm! The films have the atmosphere of Spielberg productions, including musical scores by John Williams. 1. An interesting and enjoyable anthology? 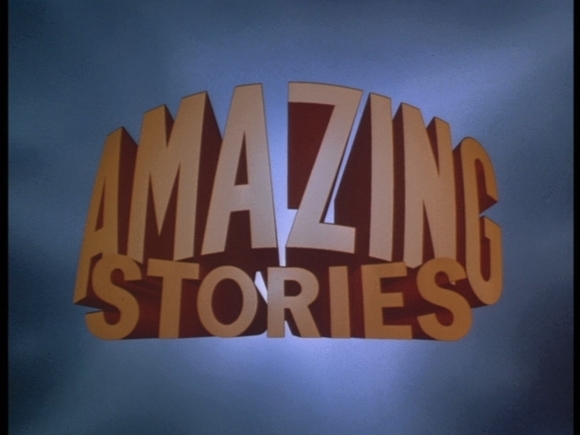 The series Amazing Stories? The Spielberg imagination? Relationship to anthologies like The Twilight Zone, Alfred Hitchcock Presents? 2. The three directors, the differing styles in their work? The re-creation of England during World War Two? The swamps in the deep South? The Middle American town and the school? Editing and pace, special effects, stunts? Musical score? 3. The title and its indication for audience response? Ordinary stories with twists? Serious and comic? The inexplicable? 4. The, Mission: Spielberg's work: the atmosphereo6fwWorld War Two, the American crew, the plane, the missions from England? Captain Spark and his responsibility? Work with the men? Jonathan and the missions? As a cartoonist? His being the good luck charm? His going on the final liaison? The bombing over Germany? His being trapped? The captain and his realisation about the landing gear? Having to land without wheels? The crew and their attempts to feed the parachute to Jonathan? Its tearing? The audience sharing the helplessness of captain a crew? The tension, the losing fuel, altitude, time? Jonathan's drawing the cartoon plane with the wheels down? The magical wheels - how credible the effect with appearing wheels? of the realism with the cartoon? Jonathan saved? The audience experiencing the central crisis? 5. Mummy Daddy: the skit on film-makers, horror films, the mummy and the action in the film? The background of the real-life murderous mummy? Harold and the news about his wife, wanting to get to the hospital, not taking off his mask and make-up? The borrowed car, the garage attendant, the locals? The mob pursuing him? The blind man and his shack? The real mummy and the fight? Harold's escape, the pursuit, the hospital, the safe birth? The irony with the real mummy going back to the film set and the director working with him? What was to happen? Humour, wit, dialogue satire and spoof? 6. Go-To? The Head Of The Class: the American town, the class? B.Q. Beanes and his tyrannical manner? Cynthia and Peter and their reaction? Cynthia and her magic, the heavy metal records, playing them backwards, the spells? Peter and Cynthia going to the graveyard, the ritual, the hope for the hiccups? The mixture and Beanes' death? The mixture that will bring him back to life? The accident with the photo? Beanes and his detachable head? The class, Beanes' tyranny with his head under his arm? The bizarre jokes? Peter waking up, nightmare? Beanes' scars? Plausible - or just enjoyable spoof?